Nobel laureate Elie Wiesel returns Hungarian government award after top officials in Budapest attend a ceremony for a Nazi sympathizer. Nobel laureate Elie Wiesel said on Monday he is repudiating a Hungarian government award he received in 2004, because top officials in Budapest attended a ceremony for a Nazi sympathizer, according to a report in The Associated Press. The 83-year-old Holocaust survivor’s parents were sent to their deaths at Auschwitz by wartime Hungarian officials. In a letter addressed to Hungarian House Speaker Laszlo Kover published by the Hungary-based MTI news agency on Monday, Wiesel criticized the Hungarian government for participating in attempts for the reburial of ethnic Hungarian author Jozsef Nyiro. 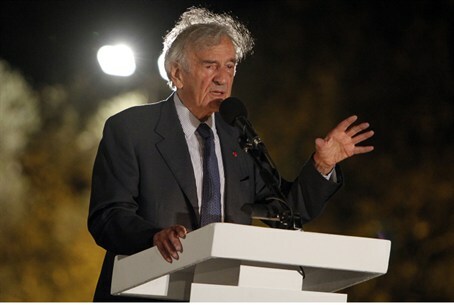 “It is with profound dismay and indignation that I learned of your participation, together with Hungarian Secretary of State for Culture Geza Szocs and far-right Jobbik party leader Gabor Vona, in a ceremony in Romania honoring Jozsef Nyiro, a member of the National Socialist Arrow Cross Parliament,” Wiesel said in the letter, as quoted by the news agency. He added that he was outraged that Kover had participated in a ceremony honoring “a fascist ideologue of the [interwar Regent of Hungary Miklos] Horthy and Szalasi regimes”. Wiesel was presented with the Republic of Hungary’s Order of Merit, Grand Cross, by president Ferenc Madl in 2004. He told The Associated Press in an interview last week that it was just “too close to home,” adding it is “outrageous” that the parliament speaker participated in the May 27 ceremony honoring Nyiro. Wiesel was a prisoner in the Nazi concentration camps Auschwitz, Buna, and Buchenwald during World War II. After the war he moved to the Unites States. He has authored 57 books, including Night which is based on his experiences in the concentration camps. In 1986 he was awarded the Nobel Peace Prize.